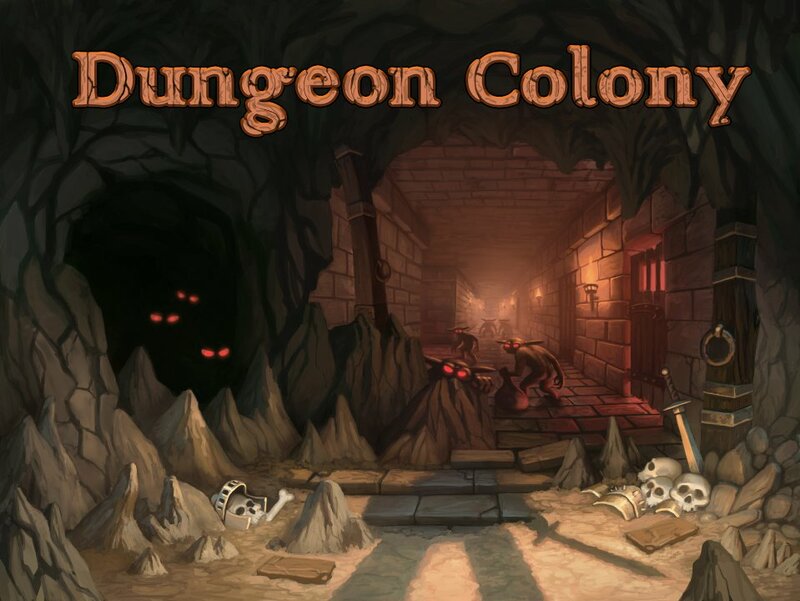 Dungeon Colony is a game influenced by one of my favorite games - Dungeon Keeper! There are currently two game modes. A sandbox, which I started first and it adds Tower Defense waves of enemies with resource collection and crafting. And I'm also working on a campaign mode. There you will play levels and do stuff in between levels on a big campaign map. The game is in alpha and should be soon ready for beta. I am updating the game quite regularly, sometimes multiple times a week. Download the alpha release on the web-site at www.DungeonColony.com. The game requires Java and it auto-updates itself if a new version is available. Version 0.2.8.0 is out and Dungeon Colony is getting mighty close to Beta status. This version completes the first Economy Update. The new economy system is tied into the new room features introduced in version 0.2.7.x. At the moment, there are 3 base rooms available: The lair, the cantina and the treasury. Minions sleep in their lair and store goods such as gold coins and other items. For each command you issue to a minion, he will want to get paid for it. After a certain amount of work performed, the minion will go to the treasury to get his wage. He will then bring his wage to his room and store it in a chest. If a minion doesn't have a room or a chest, he will complain to his master about it. Minions use their earned wage to buy food. You must have a Cantina available and place a dining table inside it. That way, your minions know where to go to buy and eat food to replenish their health and fill up their belly. Coins spend on food are transferred back into the treasury. This creates the foundation for the dungeon economy and a circular transaction system that provides a way for your minions to work for their needs. Future releases will introduce new rooms and new desires for your minions to spend their wage on, such as potions that they can use when under attack, weapons to improve fighting enemies, or other items to improve their skills. With Economy 1.0 completed, I'm turning my focus back to the Campaign game mode to work on Level design and polish the engine for Beta release. Dungeon Colony 0.2.7.0 + First Video Dev-Log ! This release completes Rooms! To tell you all about it, I've created my very first video demo. Watch it and give me your feedback! Dungeon Colony 0.2.6.12 (+) an Ester Egg!! This update includes an Easter Egg: A new creature, the Queen Spider! Also new in this version: All the work the has been done to Dungeon Rooms! Dungeon Colony Rooms - A first look! No more tower defence? Thank gods! Very cool!Looks a bit like dwarf fortress.Tracking! This game looks interesting. Tracking. if you build walls near the entrance incoming enemies will bug out and just hang around on the road, the overlord bugs out and forgets where his bed is and wont sleep and as someone else has already stated the overlord will bug out and wont study even with ample room for movement and a study picked. These are actual bugs and not something we have done wrong. Thanks for reporting the bugs. We are aware of these bugs and have increased their priority. We will post in the news when they are fixed. Looks really cool, love the artwork. While Dungeon Colony features some tower defense mechanics, I decided to finally change it's official genre to Real Time Strategy. My current development activities allow levels that don't include enemy waves and for that reason the game required to be re-categorized. The sanbox mode will remain the most similar game type to the tower defense genre, so if you fancy that kind of game mode, give it a shot. Looks really cool :) Gone give this a try. Hey there! I hadn't played this game in a while and now that I did I'd like to give some suggestions, if I may. Can you have the heads of the minions appear in the gui so that I don't have to scroll the screen to find them? I'm still having a hard time finding and killing boars. Isn't it possible to make them killable by right clicking them after left clicking them, as it currently is to fell trees? The dungeon master walks too slow! I understand that the mountain should be black in the map before you explore it, but I find it really annoying that the forest around it also is. Surely the minions surveyed the area before settling down in the cave? Oh, one more thing. A hero destroyed my workbench and I got stuck, I think... If I understand it right, there's no way to make a new one? Btw, I still love this game! Thanks for making it! The heads of the minions in the gui: Do you mean like a short-cut ? so that you can click on it (the shortcut) and them have the map center around the unit you selected ? One of my tasks is actually to allow the player to store units in the numbers 0-9, like most RTS allow you to do. Boars: Yes, I shall add a bit more at start up. FYI, over time, boars do reproduce. Workbench: You can have a Minion build a workbench in his own inventory. Make the minion collect a few wood (best harvest a large tree). Then open the minion's inventory (select the minion and click on the bag button on the right hand side). From there, craft the workbench as usual. As for the rest, I have noted your suggestions and weigh those along with other feedback. If enough testers suggest the same thing I will change it. Yes, a shortcut to select the minion, but not center around it, just select it. Number shortcuts would be great too!! I didn't know about the workbench building. Thank you. #KCAL9 where are the 8pm news?? Why is BigBangTheory on instead?? Was looking for #HolyFire updates?